No. 13 is a stunning modern end of terrace townhouse in show house condition with shomera extension and designer landscaped garden. The large family home includes three bedrooms on the first floor and two additional rooms and a bathroom on the second floor. The property consists of a total of four bathrooms. No.13 is ideally located on Loftus Lane, in the popular and sought-after development of Belmont. The property also includes a carport with room to park two cars. Behind the beautiful façade of No. 13, is a bright and well-proportioned three-story home, the property was one of the original show homes for Belmont and has been lovingly maintained since constructed in 2013. Several upgrades were completed in 2015 including the construction of a shomera extension with large folding doors on two sides which lead to a well-maintained landscaped garden. Additional storage was also added within the kitchen, bathrooms and second floor. The property extends to approx. 140 sqm /1,506 sq ft. The accommodation comprises an entrance hallway with understairs WC, elegant sitting room, leading to modern kitchen and large dining room extension with feature folding doors which open up to large granite patio. The first floor includes a master bedroom with en-suite, large second bedroom with walk-in closet, third bedroom ideal for nursery and bathroom. The second floor includes two large rooms, suitable for many uses, the second floor also includes an additional bathroom. The rear designer garden accessed via carport and side entrance, the landscaped garden includes a shed, large patio area, high-quality artificial grass and featured bench and external lighting. 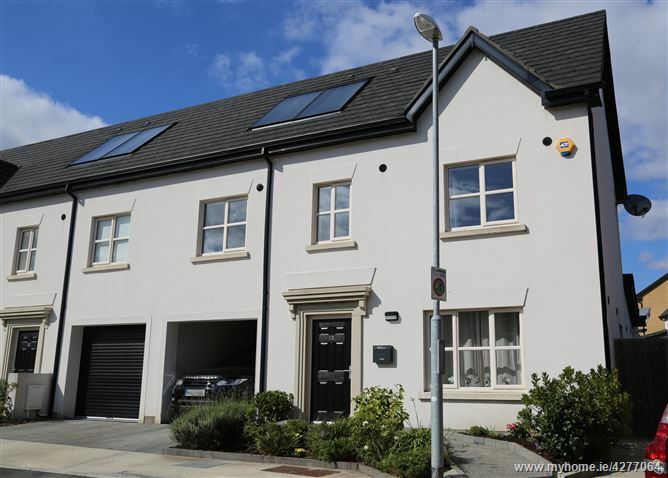 No.13 is located in Belmont, a new development on the edge of Sandyford and Stepaside and represents an increasingly rare opportunity to purchase a modern, efficient family home in an established south Dublin suburb. The Luas is an eight minutes’ walk away, with easy access to the M50 which is four minutes away. Belmont is uniquely located with easy access to the city centre and in close proximity to Dundrum Town centre. Belmont benefits from being minutes away from several rural amenities including Fernhill, Ticknock and Three Rock and a range of golf courses and driving range. No.13 is nearby a large number of schools, from preschool up to secondary school, including St Mary’s National School, Rosemont School, Stepaside Educate Together, and the Luas opens up a range of secondary schools. There is a variety of shops and retail amenities, including, Belarmine Plaza, Lamb Cross, Fleming Butchers, The StepInn, The Stone Grill, The Wild Boar and Carrickmines Retail Park and Dundrum are a short drive. Travelling south from Dundrum, travel along Sandyford Road through the crossroads with Hillcrest Road onto Enniskerry Road. Turn left into Aiken's Village and Belmont is located on the left-hand side at the crest of the hill. Travelling north from Stepaside Village, Belmont can also be accessed through Belarmine as you exit the village take a right at the roundabout and follow the road past Belarmine Plaza, take a left at the roundabout and 13 Loftus Lane Belmont is up the hill on the right-hand side (third right).